When looking to lower your BMW F30 328i or 335i go with a sport spring system you know and trust, the H&R Super Sport Springs. H&R F30 Super Sport Springs are designed for the enthusiast that not only wants to improve the stance of their 3 series, but wants to go slightly lower than the standard H&R sport springs. 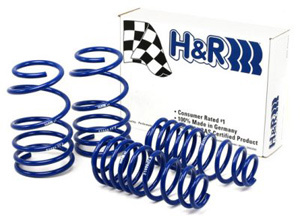 As with all H&R Super Sport Springs these springs are designed to work with your stock shocks. By replacing your existing springs with these high quality H&R F30 Super Sport springs you can expect a lower stance of 1.75" in the front and 1.6" in the rear, perfect for getting rid of the unsightly wheel gap your F30 comes with. Aftermarket lowering springs like the H&R Super Sport Springs are widely used on all types of cars to successfully lower the center of gravity to improve handling. H&R F30 Super Sport Springs are often a popular consumer choice when upgrading to a larger wheel and tire package to minimize unsightly wheel gap. When trying to decide which lowering springs are right for you, your goal should not be to drop down the car as far as possible. In many cases, overly lowering your F30 may actually be illegal for road use and cause it to perform worse than it did stock. Ideally using springs to lower your F30 are best done between 1" and 2", any lower and you would be better suited going with a coilover setup. Installation for the H&R F30 Sport Springs is classified as moderate hard. You will need standard tools to disassemble your suspension, in addition to a spring compressor. Professional installation is highly recommended for this product.